I was pleased to find outside the front door yesterday a package from Gwen Schock Cowherd, my cherished advisor on all foods German-from-Russia. Gwen had sent a jar of her prize-winning unfermented watermelon pickles, made in the tradition of Midwestern prairie dwellers whose German ancestors once lived beside the Black Sea in Russia. Gwen’s fresh-pickled watermelon tastes much like mine, but with a strong, fresh dilliness and a striking, appealing saltiness. I especially like the bit of crunch provided by the sliver of white rind showing on one edge of each watermelon piece. And notice how pretty Gwen’s pickle jar looks, with the dill heads and the sliced green pepper. Bring all ingredients to a boil. Simmer for a couple of hours, covered. Stir occasionally to distribute the flavor of the spices. Peel the watermelon, leaving a thin amount of white rind. Cut the watermelon into 1-by-1/2-inch chunks. Try to leave some white rind on each chunk; this will help to keep it from disintegrating. Drain the chunks in colanders for several hours—overnight is best. Pour off the watermelon juice. If you want to use the juice in your brine, that is OK. 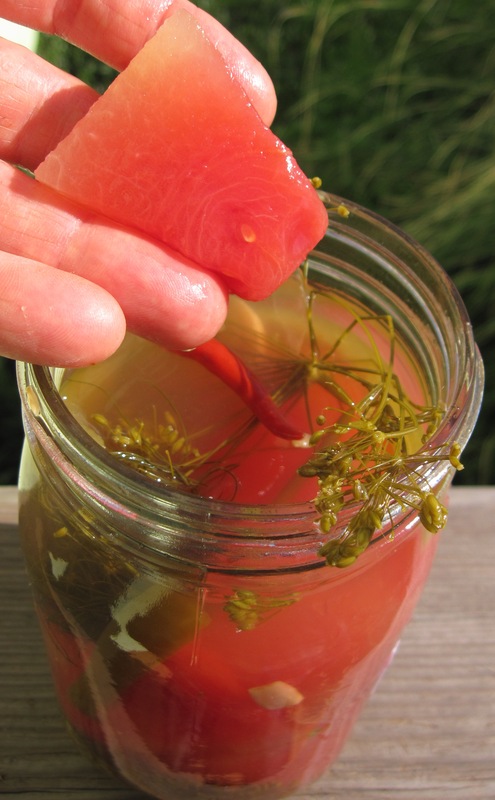 Into each sterilized quart jar, put a dill head, and add watermelon to fill half the jar. Shake the jar so the pieces settle. Then add one small dried red pepper (if you like your pickles hot) and half the garlic slivers. Distribute the garlic among the watermelon chunks. Add more watermelon chunks, again shaking the jar so they settle. Add the strip(s) of green pepper and the rest of the garlic slivers, distributing them in the jar. Put another dill head at the top of the jar. Pour the brine, boiling and strained, into the jars. (Save the extra brine for another batch. It will keep in the refrigerator indefinitely.) Add lids and rings, and put the jars in a hot water bath. Bring the water to a boil, and boil it for 5 minutes, no longer. Remove the jars from the bath and let them cool undisturbed for several hours. Check to see that they are sealed. Store them in a cool place. Gwen says her pickles improve with age. As you can see in the picture, the ones she sent me were made in 2012. Keep in mind, though, that she stores her sealed jars in an especially cool place: a refrigerator reserved just for pickles. 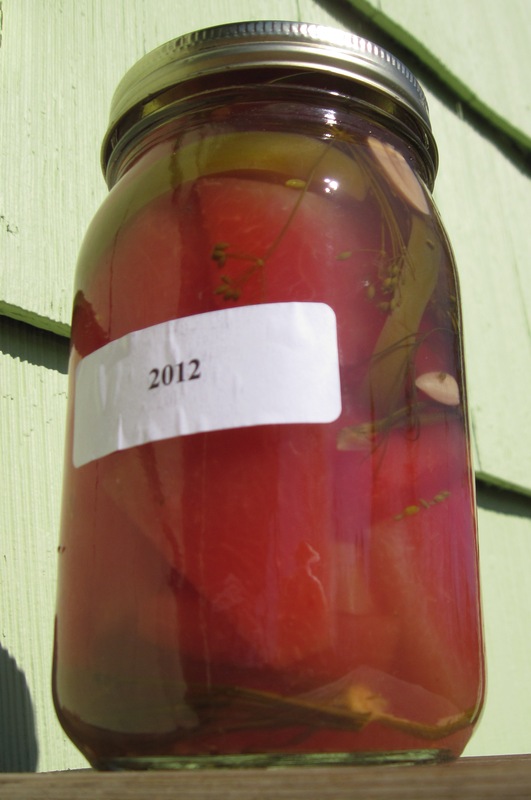 As the fermentation fad spreads, some people are saying that pickles aren’t true pickles unless the solids as well as the liquid components have been fermented. 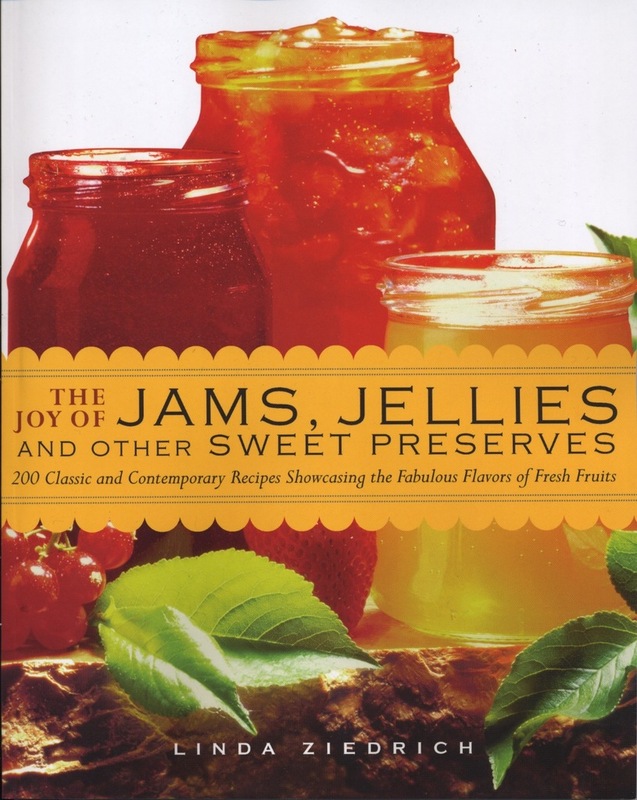 Gwen’s unfermented watermelon pickles, and my slightly sweeter ones, are very different from brine-pickled watermelon, and if you try all three recipes you may well prefer one over another. But I can’t predict which you’ll like best. All of them are real pickles, and all of them are really good. 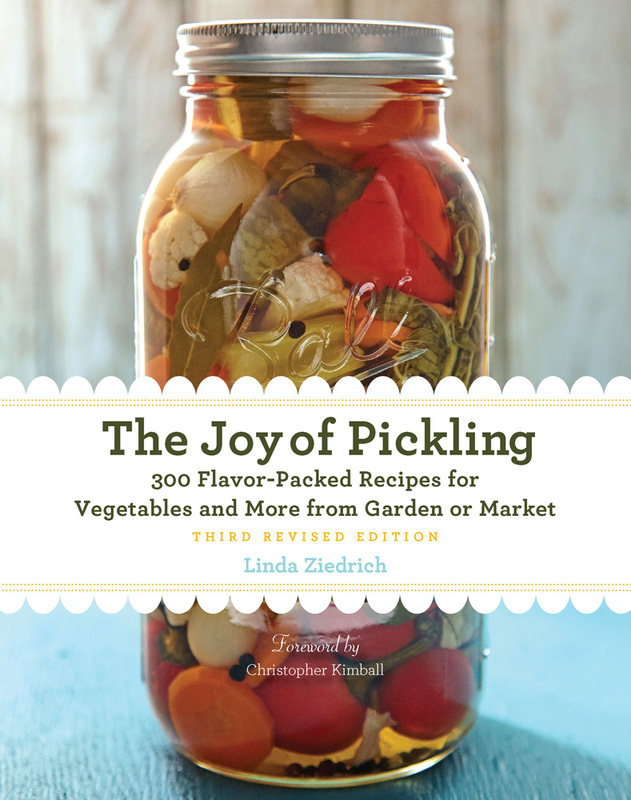 This entry was posted in Fermented foods, Fruits, Pickles and tagged canning, Germans from Russia, vinegar pickles, watermelon. Bookmark the permalink.